I can’t wait for school to start. Not for us – I’m not ready yet – but for them, the neighborhood kids. We’re operating on vacation time here, still. Bill starts orientation next week, but this week all he had to do is pick up his school books. And he did. He was gone about 15 minutes this morning. Checked the block, and he’s done for the week. It’s a rough existence, I tell you. School – for him, for the public schools, and for us – begins the week after next. In the meantime, I have this dreamy idea of what suburban, vacation living should be like: We get up whenever. Eventually, we get dressed. The kids go outside to play. They join other kids in the big communal area past our yard. They come home for Kool-Aid and crackers and grapes and apple slices. They take a break for lunch, then repeat until dinner time. On Saturday morning around 830 am, Fritz went into the backyard by himself. Almost immediately, he was joined by our 7 year old neighbor. This would have been fine, except I was still in my pajamas, hadn’t eaten breakfast, and now suddenly everybody wants to go out and play even though nobody is dressed and nobody has eaten breakfast. Thus ended my leisurely morning. On Sunday, we were barely in the door from Mass when the doorbell started ringing with kids asking if the boys could come out. And I’m not sure when some of these kids actually eat lunch or dinner, since no matter what time we do, there is always someone who comes calling then. In fact, today, around noon, a little boy would have actually walked in through my kitchen door if I hadn’t locked it to keep Peter in. I knew he was there only because the dog grunted in that general direction and I bothered to check. I really can’t have strange kids just walking in this house: the territorial dog is one concern, and just my own privacy and sense of personal space is another. Last week, Bill laid down the law: no more going out to play after dinner time. Bedtime was getting more and more hectic and happening at a later and later hour. This wouldn’t be such a big deal for my older ones, but my little ones really need their sleep. Bedtime prayers are a family event. The older ones may stay up past them, but I can’t have them running around the neighborhood until 9 pm. This past weekend, I insisted that the children begin coming in for one full hour for lunch. Otherwise, the meal was more of a snack on the run. We’d find half eaten sandwiches and half drunk glasses of water and milk on the table as my children dash back out in favor of the next game or playmate. My kids can run on fumes all day long, but I can’t allow that (although I wish I could emulate it). I’ve also had to insist that of all the hours in the day left for playing with friends (they have seven hours of free time between breakfast and lunch and lunch and dinner) that only three of them in total may be spent inside someone else’s house. On hot afternoons, I really don’t mind if the kids retreat indoors. However, at two of the three houses where they are permitted inside, the main form of entertainment is video games. They just don’t need to fill those seven hours with that. Besides, I don’t necessarily want to host other children all day long every day, and I assume other moms feel the same way. There’s a politeness factor here: how long do you hang out when paying a social call, especially when it’s someone you see all the time? I know this concept is lost on children…and I suspect it may be lost on many adults, too. Yes, having other children over generally keeps your own children occupied allowing you to actually get some work done. It’s great…until the children decide to exclude the two year old, who lets everyone know just exactly how displeased he is with that. Or until it hits those too-late-for-snack-too-early-for-dinner times, and they start clamoring for food. Or until your children decide this is a good opportunity to test your parenting tenacity and begin hounding you for every single off-limit or special treat activity they can imagine or, worse yet, flat-out ignore your reminders of house rules. Another point of courtesy: I don’t want my kids ringing doorbells, in general. I figure if the neighbors want to play outside, they’ll play outside, and I tell my kids to go out there and see who shows up. Maybe they are inside because they have chores, or family time or their mother is still in her pajamas and hasn’t eaten breakfast yet. Or maybe they are inside because their mother won’t let them knock on other people’s doors, and they haven’t overcome morning inertia and gone outside themselves yet. Or maybe I’m just a grumpy, anti-social type who really needs to settle down in rural America where the nearest neighbor is at least a half-mile away. Then it wouldn’t matter when school started for the local kids; we’d never have a ringing doorbell…and my kids would moan about being bored, and that would be just awful, right? Hmmm…I think the Army needs to figure out a way to have everyone telecommute…let’s not go to war, but say we did, huh? Works for me. So, what about you? Do you have kids constantly coming to your door, waking the baby from his nap? Do your kids roam the neighborhood freely for hours on end coming home only for meals? Are they hanging out at friends’ houses indulging in banned activities like all-day TV and video games? How do you squeeze in family time and family meals in an environment where nobody else seems to be doing that? Is seven hours of free time sufficient or is it obscene? Should I just forgo all playtime with the neighbors and put my kids to work as productive members of my domestic society? Just another good reason to be a stay-at-home mom: working mothers have obese children (H/T: Kat) But according to this British study, the more money you have, the more likely it is that your child will be overweight. I’m not sure that this is the case in the United States, but maybe because, in my small-world view, the more money you have, the more likely the mom is to stay-at-home, at least during the pre-school years. When Fritz was a baby, I worked from home two days and in the office three days. My hours in the office were shorter: 8 am to 3 pm, if I recall correctly. 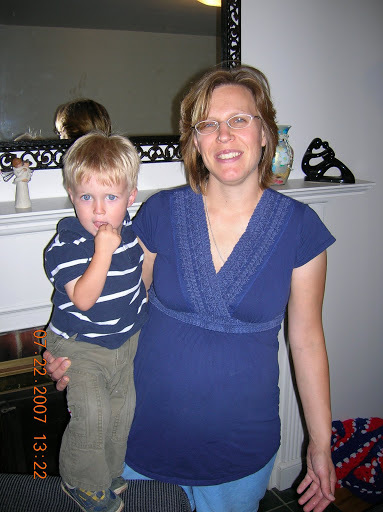 Up until he was about 15 months old, I held absolute control over everything he ate. But that was a bit of a pain, and I thought perhaps he needed exposure to a wider variety of food, so I decided to let the daycare feed him their USDA approved lunch three days a week. And he did. But suddenly, at home, frozen vegetables were disdained in favor of the softer, saltier canned type. Natural peanut butter (back in the days when you only had to wait until a child was a year old to give them it) would no longer be tolerated, but the sugar-laden stuff was gobbled up. He liked Chef-Boy-R-Dee. What a mistake I made. The trouble with first-born children is that they are guinea pigs and at the mercy of a new mother’s inexperience. The study mentions quickie meals (unhealthy, high-fat) which working mothers often resort to – yup, I did that. The study mentions that caretakers may not ensure proper exercise for the kids or that children may be left to their own devises (meaning TV or video games). The daycare Fritz was in had no TV for the infant room and limited TV for the toddler (over 18 months old) room (he was out of there when he was 20 months old). They did have time outdoors every day (unless it was really bad weather), but I doubt there was as much physical activity as my kids experience here. I just don’t see any institutional program permitting a dozen boys to engage in light-sabre battles all afternoon long. Somebody might put their eye out. Recently, sitting in the ER waiting room, I glanced through a baby magazine. There was an article on feeding your child solid food. There were some pretty alarming statistics about what kinds of foods babies, toddlers and pre–schoolers do and don’t eat, and numbers on how many school-aged children are overweight. We just don’t have these problems in this house, in part due to genetics and in part due to lifestyle. Unfortunately, these magazine articles usually only re-hash the current guidelines set out by pediatricians and don’t give too much truly practical advice. It took me three kids to learn that if I wanted my kids to eat the family meal, then I had to feed the kids the family meal, even if I cooked it a bit longer or used a baby mill to make it digestible. Peter and Jenny are my best eaters, and neither had a single jar of baby food. We’re still working on the others. The bottom line is that the healthiest kids are going to eat wholesome, home-cooked meals from the time they start solids. The more a family opts for shortcuts (from jarred food to Hamburger Helper to frozen pizza) or lets someone else do the cooking (from daycare workers to cafeteria dining to restaurant fare), the more likely it is that the family will be eating unhealthily. It was HOT yesterday after lunch. Pete was napping, I was napping, and the older kids were enjoying a mom-mandated hour of watching TV in the cool A/C. And my husband was laboring hard in our full-sun backyard to reconstruct the kids’ swing set. Unfortunately, I had been the one to go to Home Depot to buy some replacement hardware for this contraption, and I didn’t realize that two key bolts I pulled from the appropriate bin were misplaced there and were too big in diameter. Bill had warned me that sometimes the wrong lengths get put in the bins, so I had checked for that. I should have realized that the wrong diameters would be in there as well. Also, unfortunately, I had been the one to go to Home Depot to buy some replacement hardware, because the hardware aisle was just past the section where they displayed their outdoor “end-of-season” furniture including a gazebo swing for nearly half off. And I had a coupon for another 10% off, making this swing for my unbearably hot full-sun backyard too good of a deal to pass up. Since the kids’ swing set was at a standstill (lacking those bolts), and since his exhausted wife was snoozing, my hardworking guy unloaded my swing from the car and began assembling the needed tools. At this point I was up from my nap and asked him if he wanted to go get the right bolts so he could finish the swing set, but he figured he might as well do my swing which would be faster, and then go to Home Depot later, maybe after dinner. I offered to help, and we set to work in the blazing hot, full-sun backyard. I was feeling badly that I wasn’t much help. I was moving as slowly as, well, a pregnant woman in late July, and doing much more of the stand-here-and-hold-this than the run-there-and-fetch-that. So my husband, who had been laboring hard in the hot, full-sun backyard and had not rested for a half hour on a soft bed in an air conditioned house, continued to do all the hard stuff, all for my benefit, since it was my gazebo swing he was assembling. We had completed the frame, and he was doing a last tightening of the bolts, and I was covering all the exposed hardware with little plastic covers. I turned from gathering some bolt covers to see him down on his knees with his hands to his forehead. The bolts he was tightening were overhead, and his ratchet had slipped and fallen right between his eyes. Later he told me he had actually seen stars. All I know is that he pulled his gloved hand away from his head just a bit and a huge drop of very red blood landed on the patio. I ran in for a cool, damp cloth, and then sat him down in a chair in the tiniest bit of shade. The cut was big and ugly and bleeding profusely, as head wounds are apt to do. I called the health center on post, and found out they can do stitches (good to know for the future), but it was late afternoon and they had no appointments. So it was off to the emergency room. A family trip – woohoo! It didn’t take long, really. We were there about an hour altogether, and he only needed to have his head crazy glued together, which is good. The kids were impatient, but not badly behaved. Billy wanted to look at a Newsweek magazine, and we let him. Nice photos of blown up Army Hummers…you know, just what I want my kid seeing. I can’t help but want to shelter them from the hard realities of life, especially when those realities might be very personal for them. I’d rather they learn about genocide in Ruwanda than soldiers dying. And right there in the emergency room waiting area, they were able to witness other hard realities of life. Another family came in. I guessed it was a sick woman, her five children, and her mother who drove her and was now assuming responsibility for the kids while she sought medical help for fever and chills. They were from the “high-rent district” as my husband sarcastically called it. Afterward Fritz remarked that the grandmother’s voice was different than most women he knew. I explained that her voice was likely deep and gravelly because of years of smoking. She was also loud…and mean. The kids noticed it, and I couldn’t protect them from what they saw any more than I could protect the little boy, about their age, who seemed to be the target of the bulk of her nastiness. I really didn’t understand it. The two older kids, a girl and a boy, looked to be in the 12 to 15 year range. Surely the older girl could have babysat the other ones, I thought. The grandmother told someone on her cell phone that she was stuck with the kids and had to try to keep from killing them…a phrase I sometimes use, too, but usually with a tone of frustration, not loathing. At one point she had four of the kids around her, but the one little boy had been banished to a seat a bit apart. She was handing out a snack, and the little boy, excluded from the group, began to cry. She called him a “crybaby,” permitted him over, gave him a handful, and then sent him back to his corner. She then began to dote over his little sister, about 4 years old, asking for kisses for more treats. What really broke my heart was the look on the older kids’ faces: completely undisturbed by her treatment of the boy. The oldest girl smiled and played with the littlest girl and seemed quite as ease with the whole situation: not just a numb acceptance of abuse, but almost an approval. Soon, we left, and my kids were free to tell me what they thought. I guess they got a lesson in empathy. They couldn’t believe that any grown-up, certainly not a grandmother (grandmothers being even more loving than mothers, in their personal experience), would talk to kids like that. All of my rules about talking to others, including the golden rule of not calling people “stupid,” seemed to have been broken by this woman. Why? they wanted to know. Why did she treat them like that? The best answer I could give was that she didn’t know any better. She never learned that it’s not okay. We had drive-through for dinner, because it was past that time. And then we went to Home Depot, and I got the right bolts (and nothing else). At home, we managed to finish the swing before bedtime. Now, I have a comfortable, shaded spot where I can hold my little ones close and tell them how much I love them. And where my husband can sit and drink a cold beer when he needs a break from working on whatever other projects his wife devises as she wanders through Home Depot. She came to my house. Yes, that’s how she operates: house calls. And let me tell you, I love it. We sat in the living room. We talked. She got herself up to date on my pregnancy. She gave me some organic pregnancy tea. She had me lie back on the couch and then we all – all, except for Jenny who wanted to be outside and Bill who had to chase her down – listened to the baby’s heartbeat. She palpated my womb and explained to the kids that she could feel the baby’s leg, the baby’s back, the baby’s head. They were absolutely fascinated. I forget that for all my pregnancies where I would go by myself to the doctor or midwife that they wouldn’t get to do this. Not only was it educational for them, I could see their eyes light up as this woman made the baby’s life very real to them. They were able to do some of the pre-birth bonding that I take for granted, since I do it every time, like right now, that I feel the little squirms and kicks of this child. So, that was great. But then she even drew my blood right there at the dining room table (with two of my kids covering their ears as they watched?) and administer a shot of RhoGAM I needed. If I could only find a family practitioner who made house calls…this was just simply my best experience at a medical appointment. 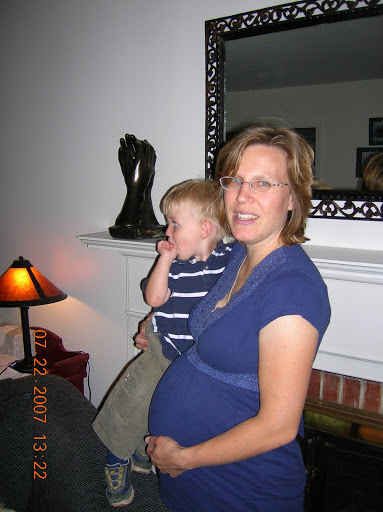 We went over her list of dos and don’ts – no TUMS for heartburn because she’s noticed calcification on placentas (fortunately, I’m not having that problem this time), eat lots of protein, try eating more bananas since I’m starting to get leg cramps at night. We talked about a birth plan – five prior labors and deliveries and never once a serious discussion about a birth plan, initiated by the caregiver. We talked about the three hospitals she can use, and her preferred one, which is an hour away. And we talked about home birth. Surprisingly, Bill is pretty open to that whole idea. My mom, though, seems a bit skeptical, thinking possibly that they are overrated having had one herself. Of course my mom’s home birth was the kind of home birth that nobody would ever want: three sleeping children, husband hundreds of miles from home, family only maybe 15 or 20 minutes away, but too far away to get there before the baby did. No, I wouldn’t want to deliver my own child, if that’s what a home birth meant. I’m on the fence about the whole thing. I’ll pre-register at the hospital, but I’m keeping an open mind on delivering at home. And if a home birth is to a hospital birth as a house call is to going to the doctor’s office, I’m already sold. I talked to a good friend last night. I last saw her in June at her new house. She had been there for three months and was still slowly unpacking boxes, one at a time, putting things exactly where she thought she’d want them to be for the next decade of her anticipated residency there. It made perfect sense to me, but later I thought about it and realized that I had no such luxury. If it took me 3 months or longer to unpack, I would never have a chance to enjoy that “settled in” feeling before I needed to start weeding out accumulated stuff and getting ready for the next move. Yesterday, Bill put on his uniform for the first time in five weeks. He signed up for an in-processing slot, tried to touch base with a few contacts and came home. Rough first day back at work, huh? He headed out a bit ago to go to his in-processing appointment, and will be home by lunch time, and he just may be done at that point. In-processing is expected to take up to two whole days, but he’s already done a number of the things covered: get our cars registered on post, get the dog in the on-post vet’s system, transfer all our health insurance information to this different regional system. Once he’s done with all of that, he’ll be free to do whatever he wants (within the local area) until August 7th when he needs to pick up his school books. I’m enjoying every minute of his time off work, but I think he’s ready to get back to a normal routine. I think perhaps the Army is less demanding than I am. On Monday afternoon, Billy asked him what his plans were, and he said he was hanging curtains, “because Mommy loves curtains, and hates Daddy.” Actually, Mommy loves curtains, and hates the old, yellowed and patched roll-up shades covering every window in this house. And Daddy just happens to be a superb curtain hanger, using fancy tools like a level and a tape measure to get things just right. I prefer to eyeball it, and really don’t care if the left side is a quarter inch lower than the left, since I can’t see up that high anyway. And I won’t be living here for a decade. And now on to establishing new routines, new habits, new schedules. Which will last approximately 3 months when the new baby will decide that the whole known universe needs to conform to his/her preferred way of doing things. I think our big goal this year will be focusing on working independently. Yesterday we dragged the kids into Kansas City to hit the big shopping areas for the long list of things we weren’t able to find locally. We promised them lunch at a restaurant for their inconvenience (and it is tough to watch mom and dad buy things for themselves and not for you, I know). They picked Pizza Hut which has a lunch buffet for about $2 for kids (drinks not included, naturally). This was fine for me, especially since the food was ready and that meant no wait. Bill took the boys to the restroom while I helped the girls (and Pete) select food. Then I took the girls to the restroom while the guys stayed with Pete. When we finished, the girls ran ahead to the table, and I stopped by the buffet to pick out a slice. I was the last one to sit down, and our waitress had already brought the drinks I ordered when we first got there. Everyone but me had straws, and I looked around, but didn’t see another one. Then I saw Pete concentrating very hard on removing the paper from that seventh straw. His little fingers could only grip a tiny piece at a time, and I knew (having seen him do this before) that he would be occupied for several minutes pulling off bit by tedious bit. Oh well, I thought, I don’t need a straw. I’m a big girl; I can drink from the cup. I focused on my food. After a minute, Pete finished his work and then got down from his chair. I inwardly sighed. Great, we’re here ten minutes, and he’s already lost interest in eating (and sitting still), I thought. I watched to see if he had a motive or if it was truly just boredom that inspired him. He scooted around the table to my chair. He smiled broadly and offered up his labor of love – the opened straw. “Here, Mommy,” he said sweetly. After my sincere thank you, he ran back around to his seat, climbed up, and went back to his food. Spoiled and pampered, wonderfully, by my two-year-old. It doesn’t get any better. You know, the one that got my household goods delivered the next day. Now that I can get to the internet from my PC (where I have the capability to download photos), I had my husband take my picture wearing that blue shirt. It’s nearing the end of it’s usefulness – one of those “buy your pre-pregnancy size” shirts that works fine for the middle trimester, but now that I’m approaching 28 weeks, is beginning to get full in the belly…and in the chest. In fact, I think it looked cuter 2 weeks ago when I dealt with the transportation people. But here I am in all my sensual hippopotomic glory.